Released in 2010, HyperComet was a Japan-only version of YoYoFactory's FireDog, rebranded for Bandai's Hyper Yo-Yo series. It uses a nylon transaxle, giving it longer sleep times than a traditional fixed axle. The yo-yo is not a take-apart design which means the only maintenance necessary is the occasional replacement of the string. It came with a blue string from the maker. It has a traditional flywheel shape that is a great foundation yo-yo for new players. Came with a user's manual with instructions for basic care and tricks. 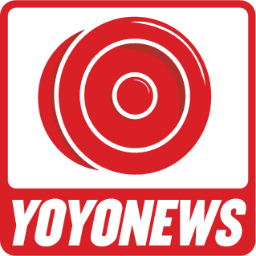 As with all Hyper Yo-Yos from Bandai, you could use this yo-yo to earn your official Hyper Yo-Yo certification at an official participating store in Japan. This model of yo-yo was given away at the 2010 World Hobby fair--the time that essentially marks the beginning of Bandai's second Hyper Yo-Yo boom (the first began in 1997 and lasted approximately three years). 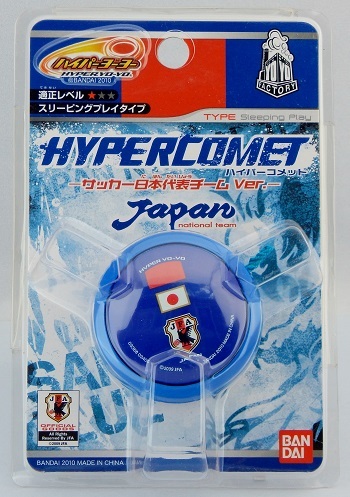 This particular HyperComet model was a limited edition release commemorating Japan National Soccer team's entry into the 2010 World Cup of soccer that took place in South Africa. The Japan National Soccer Team's logo and the Japanese flag are printed on one side; the opposite side has printed "Japan 10". Player number 10 was the midfielder Shunsuke Nakamura, one of the leading goal scorers on the Japan squad.